A highlight of our dinner tonight is a treat of Peking Duck, China’s favourite duck dish. Named after after its capital city, this crispy and aromatic specialty has been served on Chinese meal tables since the Southern and Northern Dynasties and it was recorded as one of the dishes on the imperial court menus in 1330. The Peking Duck dish has found its way into Chinese restaurants around the world and most people who have dined at Chinese restaurants will be familiar with China’s national dish. But for anyone not familiar with the dish, Peking duck is composed of a small pancake on which sweet bean sauce is spread and on top of which is placed the thinly sliced crispy-skinned duck and a stick of cucumber or two. Sometimes you get a slice of scallion as well. It’s easy enough for the restaurant to slice up the Peking Duck in the kitchen and serve the sliced up meat to your table, but the ceremonial way is for the duck to be rolled out on a trolley. 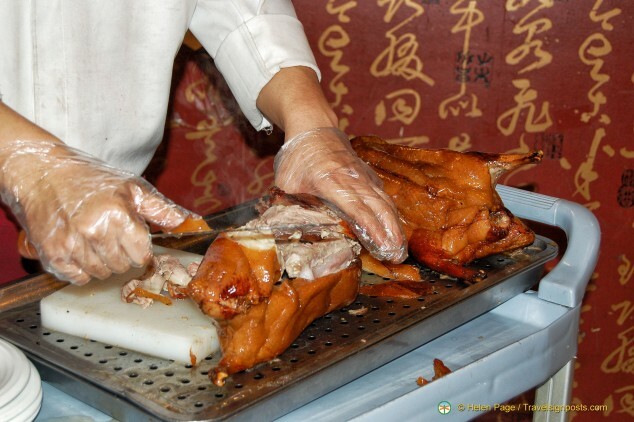 In the view of the restaurant guests, the smartly dressed Peking Duck chef then expertly goes about the act of slicing off the crispy skin for the Peking Duck dish. The Chinese never waste food in cooking and the remainder of the duck is brought back to the kitchen where the meat is cooked with stir-fried vegetables and the bones can be used to flavour soup. 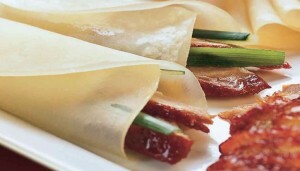 With the ingredients placed on the table, we are left to make the Peking Duck pancakes on our own, being careful to wrap the ingredients so that they don’t spill out of the pancake when you take a bite. The crispy and aromatic duck flavour is enhanced by the sweet bean sauce and the texture of the soft pancake is offset by the crunchy cucumber. As vegetarians, we let others enjoy our share, but as we haven’t always been vegetarians, we know full well what this special dish tastes like. Peking duck is one of the highlight dishes at any Chinese celebratory dinner and once you’ve tried some, it can be addictive. There is the amusing account of how the Peking Duck may have been the reason behind the rapprochement between the United States and China in the 1970s. As the story goes, after Henry Kissinger, the then-Secretary of States, had a morning of inconclusive talks with the Chinese, they stopped for lunch and were served Peking Duck, a dish which quickly became one of Kissinger’s favourites. The next day, there were positive joint statements from the Chinese and American delegations, including the invitation for President Nixon to visit China. Kissinger wasn’t the only political leader who developed a liking for the Peking Duck. Fidel Castro and the former German chancellor Helmut Kohl are a couple of others mentioned as being fond of Peking Duck. If you have a chance to try this dish in Beijing you should do so – Kissinger did and it did a whole lot of good for China-U.S.A. relations then. Peking Duck requires special preparation and this is a dish that is usually not cooked at home. There are a number of restaurants in Beijing that specialize in Peking Duck, including the famous Quanjude, Bianyifang and Changan Yihao.